I recently received several products to review from Born Pretty Store. I plan on reviewing these products over the next week. The first product I have for you is their crackle polish, something I was pretty excited to try in anticipation of OPI's new crackle ("shatter") polish coming out at the first of the year. However, compared to pictures I've seen of OPI's new polish, this one seems much more "crackle-y", something I really like. This is all 5 of the crackle polishes offered by Born Pretty Store swatched over silver (Misa Got to be Reel). From thumb to pinky: yellow, red (it's more pink than red, IMO), blue, green, and black. I apologize for the quick skittles pic, but I have a bit of a backlog, and a camera battery that needs to be charged, so I wanted to make sure I did a post about this as quick as I could. I do plan on more detailed pictures in the next few days. I never really got into the crackle polish thing, when Cover Girl first released them to the masses, back in the later 1990's, but I must say that I'm digging this look, especially the red (pink) over the silver and black over the silver. I think they are a really cool way to spice up an old manicure or a quick way to do a nail-art-ish look without spending the time actually doing nail art. These would also be a great way to do a "team colors" mani, provided of course, that one of your team colors is one of the crackle colors. - for more crackling, only use one coat of the base color (so something highly pigmented is better). I used 2 on my ring (green) finger and you can see that the crackling is deeper and not as pronounced. 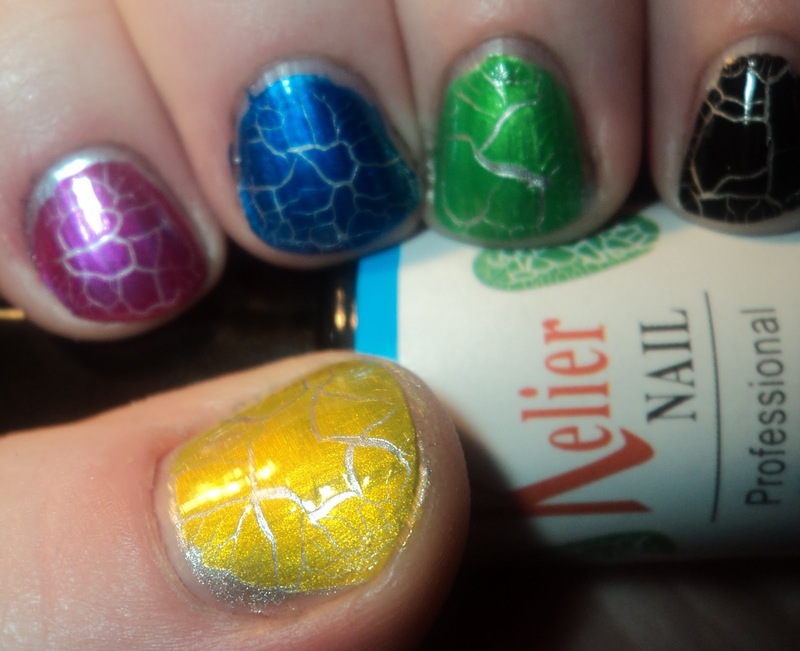 These crackle polishes are available at Born Pretty Store (see above for link). They come in a 4 pack (all colors except for yellow) for $12.87 or $3.67 individually. Born Pretty Store ships free to many countries (see their website for details). Be sure to stay tuned for more items from Born Pretty Store. i had a couple of the covergirl crackles when it came out,but i stupidly threw them away when they got thick(i didnt know about nail polish thinner). these look nice. i agree, the OPI ones do look like the shatter a lot more. a lot more dramatically than the ones we own!